I once saw a guy play this out on turn 1. I thought it was an accident until he went Snowfury Giant, coin, Snowfury Giant. He conceded when I played my own Crackling Doom. they should put this card to standart game. shaman will be playable again. WTF is this card? I just saw it in a Kripp video and I've played this game for 3 years and had never seen it before! It is one of the Arena only class cards they just released. 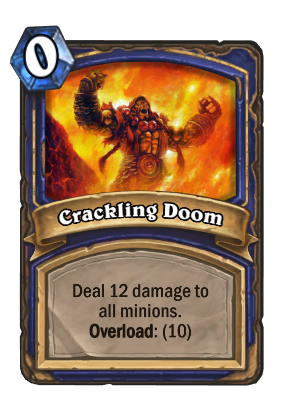 Crackling Doom has the same animation as Elemental Destruction. Disappointment. I agree! This card is pure cancer. My arena exprience is ruinded because this card. Its really fun when they use this and after that 4 mana 7/7 in turn 4!